Have you found an online vendor selling Florida Mermaid 3-Year? If you know anything about Florida then you SHOULD know that the home of Florida mermaids is in Weeki Wachee, Florida. 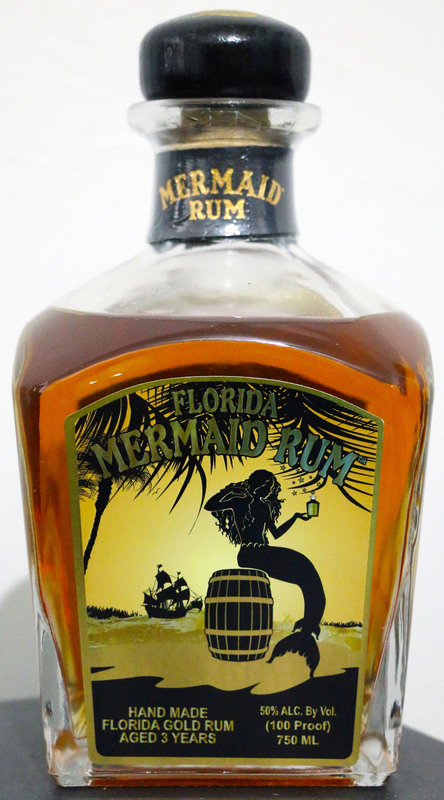 So it's no wonder that Florida Mermaid Rum originates there. It is distilled by NJoy Spirits which also produces Wild Buck American Rye Whiskey. Surprisingly the stores locally do not carry this rum. I had to cross the state line into Georgia in order to discover it. According to their website, this rum is "3 year old Florida Sugar Cane sipping rum blended with a Caribbean pot still rum then aged in our National Award Winning Wild Buck Whiskey barrels for 90 days". The color is a solid amber and is very clear. It has a wonderful aroma with floral undertones. The flavor is nice. There is evidence of the tannins from the whisky barrels which I presume are oak. But the oak is not very noticeable. There is an initial sweetness that in my opinion indicates this rum has been sugared but it's not overly sweet. I detect some almond and vanilla at the beginning. Maybe a hint of butterscotch? There is some butteriness to it as well. It has a lingering finish with the almond flavor giving a slow fade. All in all this rum is quite good and definitely qualifies as a sipping rum. I imagine it would do well as a mixer but I have not attempted anything along those lines other than some Coke Zero and it works quite well with that. If you're looking for a local Florida rum to swap out with Captain Morgan, this isn't it. This is craftsmanship in a bottle. The owners operate a small farm about an hour north of Tampa, where they grow their own rye grass for whiskey and rotate the fields with their own sugar cane for the rum. 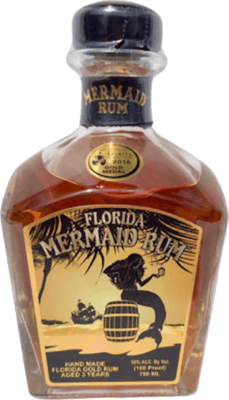 They don't do a bunch of flavors, just the one rye whiskey (Wild Buck), and this barrel-aged over-proof rum (Florida Mermaid). A strong aroma of apples and honey greets you as soon as you start to pour. It smells sweet, but he first sip is a strong, dry, oaky rum with a long finish that leaves behind a hint of rye whiskey. Add a little ice to settle it down a bit if drinking it straight. It features well in cocktails, like a punch where you still want to taste the rum, but I like it on the rocks with a cigar. Being a local of this rum. I am disappointed in the quality of this rum related to it's price tag. It would have been great to add a rum that is local to the collection but I just cannot justify the cost of a rum that tastes the same as a cheap liquor store special.